I am SO excited about this two-part series!! 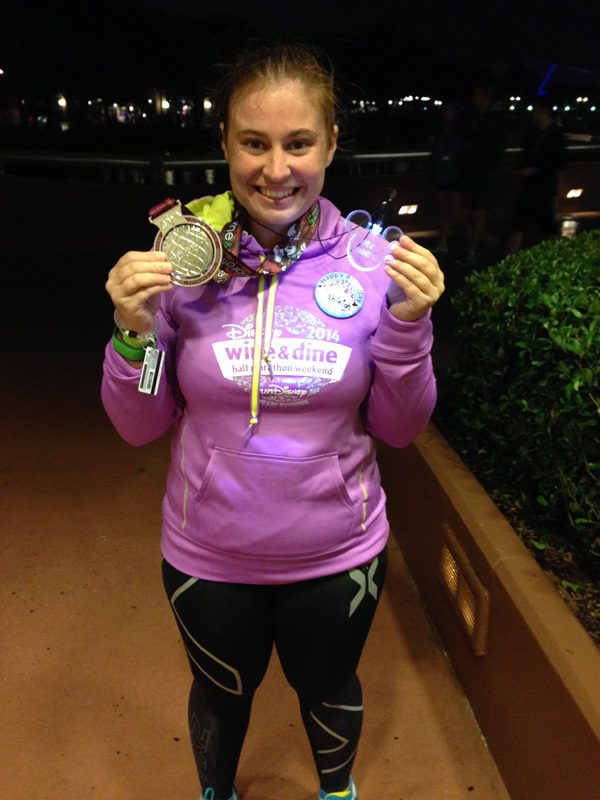 Ashleigh contacted me about doing a guest post on her runDisney experience and when I found out that she was traveling all the way from Australia to run both the Wine & Dine Half Marathon Weekend AND the Avengers Half Marathon Weekend to complete the Coast to Coast Challenge, I couldn’t wait to hear all about it!! Here’s Part 1 of Ashleigh’s adventure! Hello everybody! Sarah kindly asked if I would blog about my experience running Disney as an Australian having travelled over to the States for Wine and Dine and Avengers. 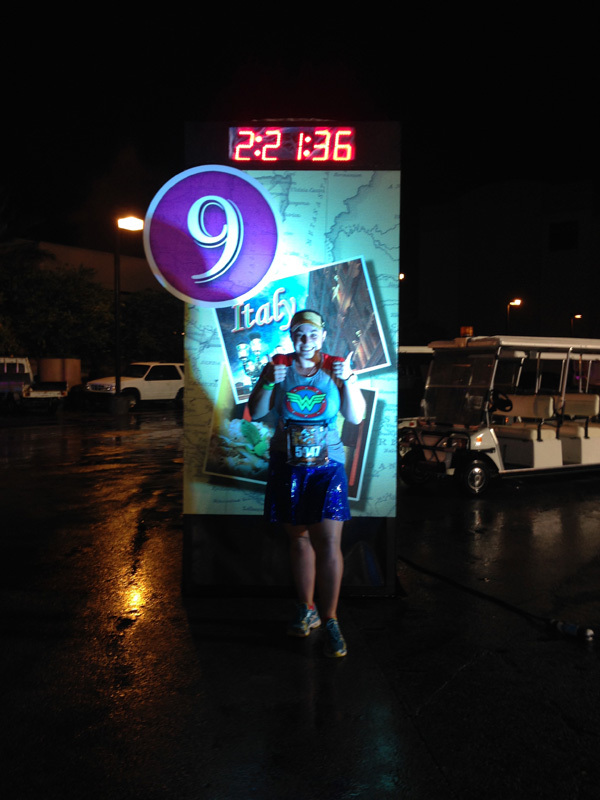 I will be writing a two part series, talking about my trip as a whole and the excitement of Disney and the runDisney races. Deciding to travel half way across the world for a couple of races was not as easy decision. I am not what you would call a natural runner, I am about as far from a natural runner as you can imagine. I began running in July 2011 when I signed up for a 5k with my mum in support of a friend who was diagnosed with breast cancer. 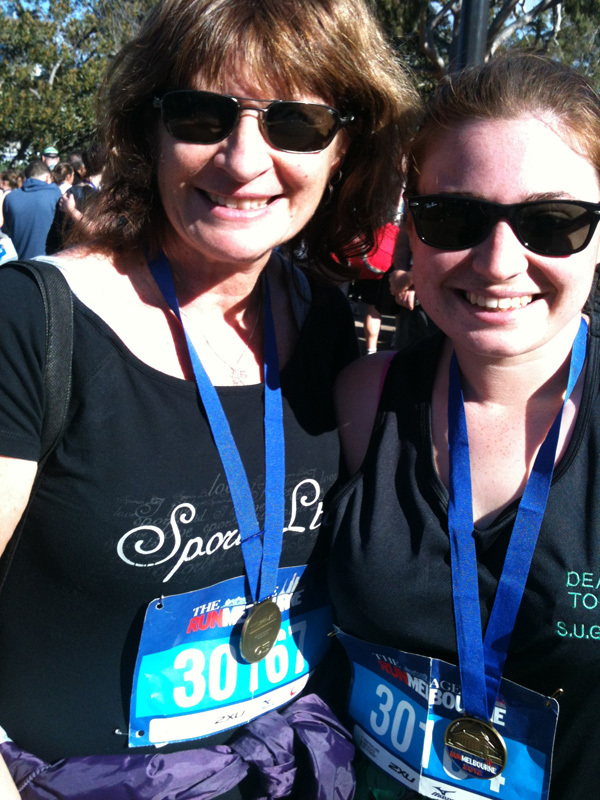 My mum and I after my first 5k! After that I was hooked- I signed up for another 5k and another and another, then a 10k and finally a half marathon a year and a bit later. I found out about runDisney when I saw it mentioned on Facebook, and after doing some research I began following Jeff Galloway’s run-walk program, which is what gave me the confidence to sign up for more races after my first 5k. As someone who has always struggled with running and I had some pretty bad experiences with sport in school (not so supportive physical education teachers), the idea that someone who had run marathons at Olympic level was telling me it was okay to take short walk breaks when I ran was amazing. 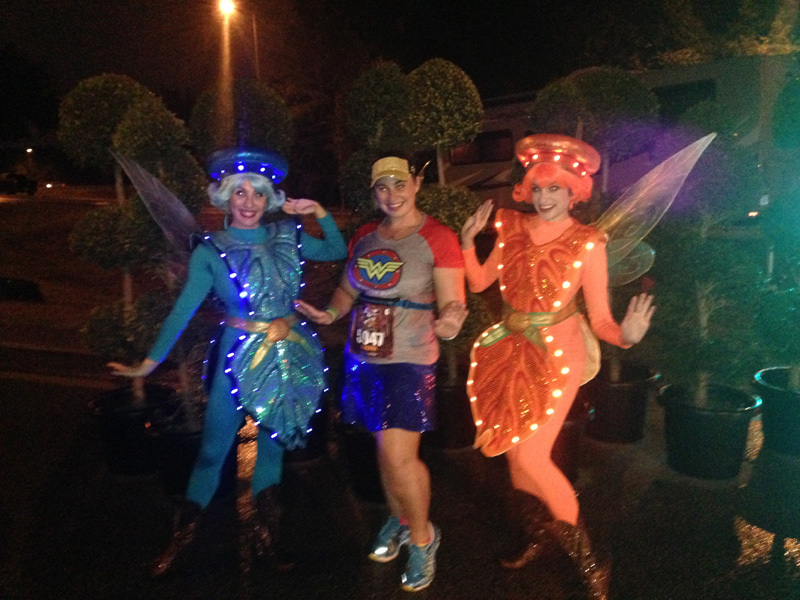 So that brought me to the idea of runDisney- I liked everything it stood for, running for the fun of it, running not be the best but to be the best me and hello…Disney characters on course!?! Photo opportunities!?! Wear my medals around at the park the next day and have people stop and congratulate me!?! YES PLEASE!!! I love living in Australia, but the running culture here is very different. 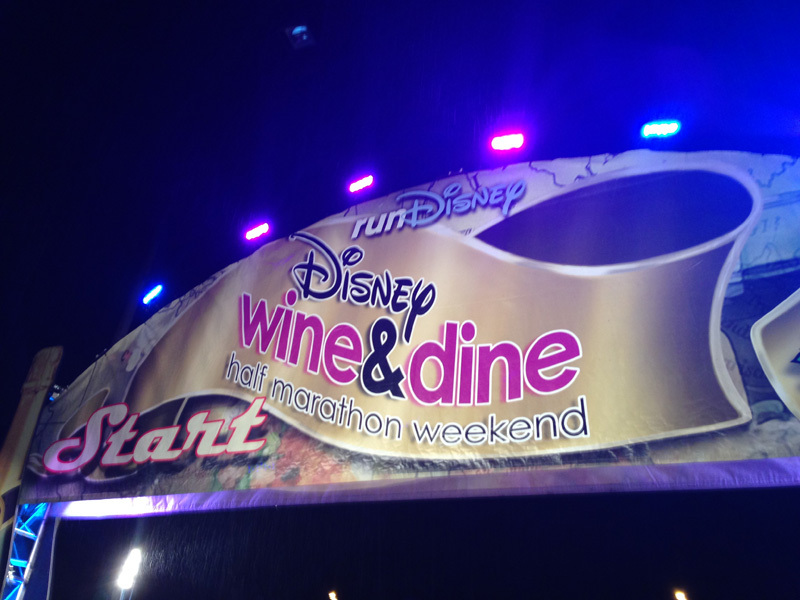 We don’t have runDisney or Rock n Roll or Diva running events. Everything feels a lot more serious, and there are a lot less races. The fields are smaller, but the quality of runners is higher, so there are still quick finishing times, but at my home state of Victoria’s big half marathon (The Melbourne half marathon), I was at the back of the pack with a 2:41:57 finish. My first half marathon finish! 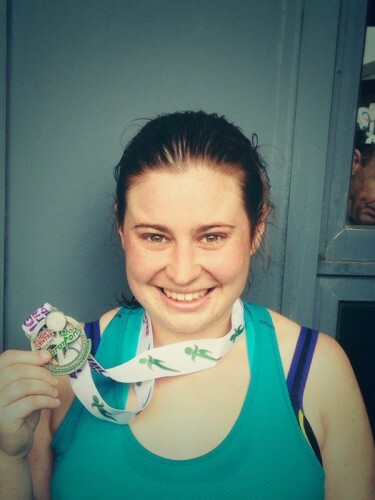 I mean right at the back, which is fine with me- but the idea of being able to run a race where there are other runners just like me- people running for fun and to better themselves even though they might not be the speediest runners, really appealed to me. So runDisney was officially on my radar. But how does one justify flights, accommodation and an international trip for a race? With great difficulty! After finishing university and settling into work I got some hard news that a very dear friend had been diagnosed with multiple sclerosis. It was really hard to wrap my head around the fact that a friend only a few years older than me had suddenly been told that he had an incurable disease that would essentially affect the rest of his life. 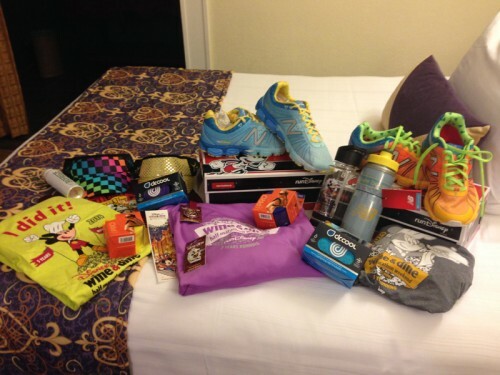 The reasons I had chosen not to do runDisney were stupid. Money. Work. The difficulty in planning. They were not good reasons to miss out on something that I was so passionate about. Life is short and if we don’t take opportunities when they come up, we might end up missing out on them altogether. So when registration opened for Wine and Dine 2014 I took the plunge- the race was on my birthday, and I took that as a sign. I followed that with registration for Avengers (and registration for Dopey but more on that another time). I was registered and I was over the moon- then came the training. I actually had my strongest training block ever, even though it was actually Dopey training, so I left Australia feeling excited, because I knew I was ready. After a lot of flying-Maningrida-Darwin, Darwin-Melbourne, Melbourne-Sydney, Sydney-Dallas Fort Worth, Dallas Fort Worth- Orlando, I finally arrived at Walt Disney World with my boyfriend who joined me for the trip and acted as support crew for the runs. We hit up the parks everyday and when we went to the expo I went crazy! My expo purchases! A very successful day in my book! KT tape sells for $30 a roll in Austrailia and was 2 for $30 at the expo. Dr Kool- doesn’t exist in Australia? Cindy shoes- tick. Goofy shoes-tick. Pins- tick. Tumbler- tick. I did it shirt- tick. Tech shirt- tick. You get the idea. 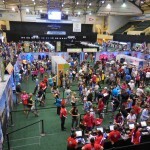 I loved the energy at the expo, it was a little crazy but really well organized so even as a first time runDisney participant, I found it really easy to navigate my way around and find everything I needed. When I saw my bib for the first time I couldn’t believe it. Me. Ashleigh. I was running in a runDisney race. It was amazing. On Saturday we woke up and went to Animal Kingdom for a few hours before returning to the room at about 2. I used this time to nap, relax, re read the participant info booklet, and double/triple/quadruple check I had everything ready for the race. 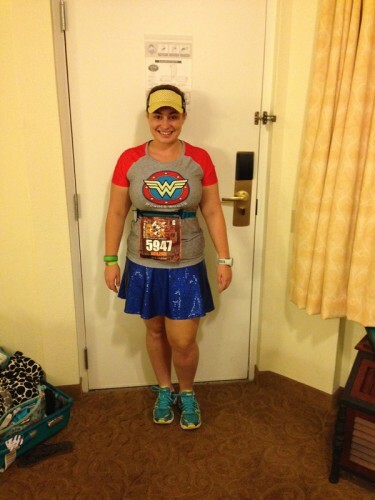 I went with a simple wonder woman themed costume, and even though temps were set to be around 55-65 degrees, I opted to run in just a t-shirt and running skirt as I find I overheat very quickly and I didn’t want to be stripping off during the run. Simple Wonder Woman inspired costume. It was super comfy to run in! I jumped on the bus at Port Orleans French Quarter at around 7, and I arrived at the race by about 7:20. When I arrived at the race I quickly jumped in line for a photo with Chef Mickey- which proved to be a smart choice because by the time I had my photo taken the line had about doubled (and I ended up being in line for approx ½ hour). Chef Mickey and I. I love this photo! I decided to skip the other character photos and instead take some time to sit down and relax before the start. Some very friendly runners chatted with me while we waited for the corrals to open, and at about 9:00 I made my way into the corral. 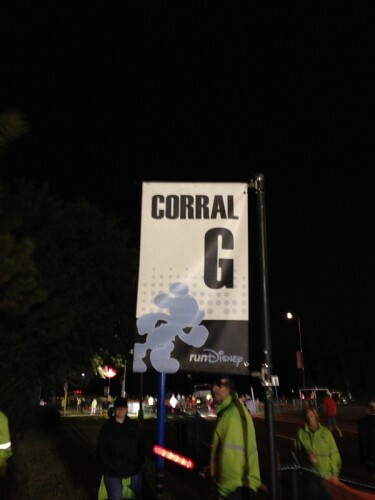 Corral G! I was really happy with my corral placement- it was an excellent fit! A gentleman in the corral kindly gave me a garbage bag as it started to rain almost as soon as we stepped into the corral and this ended up continuing for almost the whole race. Thank you to that mystery man- it was VERY MUCH appreciated! 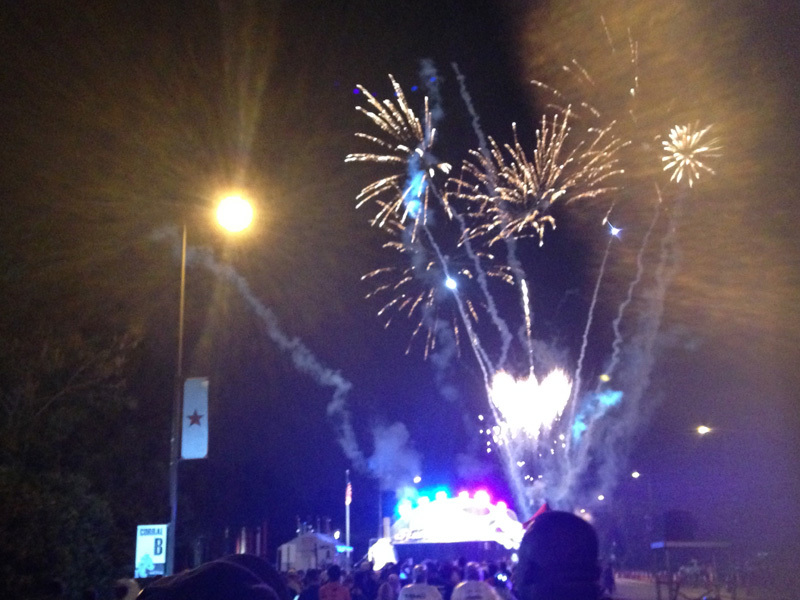 As I stood at the start line watching the fireworks go off, I was overcome by a sense of gratefulness. I was grateful for everything, the ability to run, the chance to be there, the opportunities that I had allowed myself. The start line was amazing! I stripped off my garbage bag and bounded off as soon the fireworks went off for my corral. The fireworks were even more amazing. I can’t think of a better way to start a race! 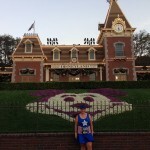 I had decided to run 4:1 intervals and stop for as many photo stops as I liked, because it is not everyday you get to run at Disney! I stopped at every mile marker for a selfie, and I stopped for photos with the fairies, Timone, the Animal Kingdom tree, Buzz and Woody, the Incredibles back drop, the Osbourne lights and Captain Jack Sparrow. I also saw photo ops (but didn’t stop) for King Louie, a Star Wars character (sorry I am not a big Star Wars fan) and Country Bears. I could be forgetting a couple, the race was a bit of a whirlwind. I heard the green army men yelling at people but I don’t remember seeing them, I kept thinking I was about to run past them but it never happened- they may have been on the other side of the road. 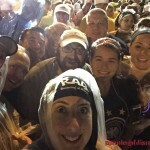 As for the actual running part, it may have been raining, but I was having a ball. 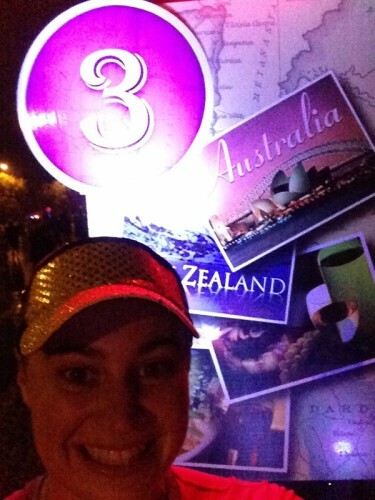 I run in km in Australia so I just imagined that every mile marker was a km marker, so it felt like the race was only 13km! Of course I stopped with the Australian mile marker! The course was really interesting as it began at ESPN, then through Animal Kingdom and Hollywood Studios before finishing in Epcot. As someone who wasn’t overly familiar with the Disney World property it was actually a great way to tour around and see the parks. 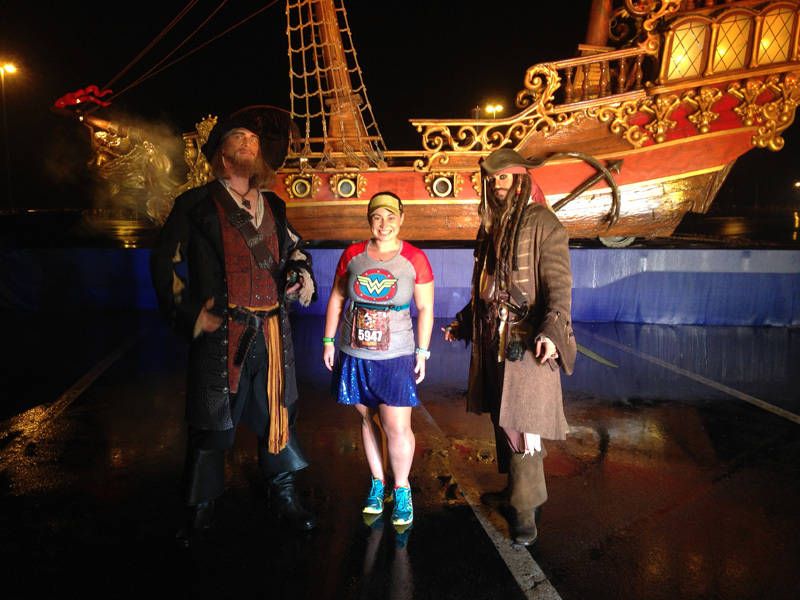 Although there were some huge puddles, there were lots of cast members and volunteers pointing them out, the aid stations were well organized and the medical tents and staff were amazing. I really enjoyed running through the parks because there was just so much to look at. I honestly remembered feeling disappointed at the 6 mile mark because I was sad it was half way over. I was hi fiving cast members left, right and centre and I loved the way random runners would strike up conversation for a couple of minutes. While many people complained about the weather, nothing was going to rain on my parade on Saturday night! Still feeling awesome at mile 9! As we ran along the Boardwalk I was just so excited to see that finish line, and once I saw Spaceship Earth, I knew I was almost there. 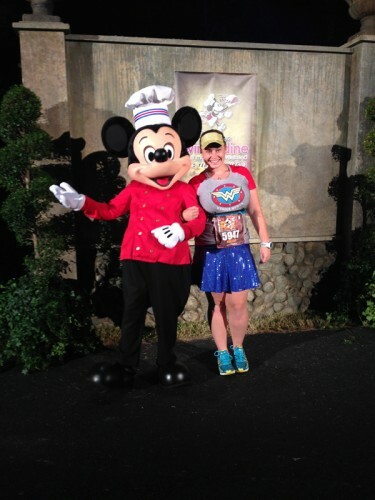 As I had run so conservatively the whole race, I had heaps of gas left in the tank and basically sprinted toward Mickey, hi fived him and then leapt across the finish line. I was given a finishers medal, wrapped in a space blanket and lead down the chute. I had my photo taken before being given some food. I was lucky enough to have my lovely boyfriend waiting in Epcot with dry clothes so I could skip Gear Check, and I skipped grabbing a drink because the lines were just too hectic. I am a super impatient person so having all those people around and lines barely moving equals a very grumpy Ashleigh. I decided it would be best for my sanity if I just skipped the drink and moved straight through to the after party where I could have some breathing room- and show off my awesome medal! I met my boyfriend at the Australia (of course!) pavilion in Epcot and changed into some nice dry clothes and got some photos with my medal. Very happy to have my medal and be in dry clothes! We ended up finding Dopey and Snow White and Pinocchio- I was disappointed that I had just missed Donald (my favorite). I was starving so we went to Italy, Morocco and Brazil and that satisfied my post run hunger. We decided to leave at around 3:15, but unfortunately our bus had a huuuuge waiting line, so I think we waited around ½ hour before we managed to get on the bus, and by this time the rain had started to get heavier. We arrived back at French Quarter and I had a quick shower before settling into bed at around 4:15am. 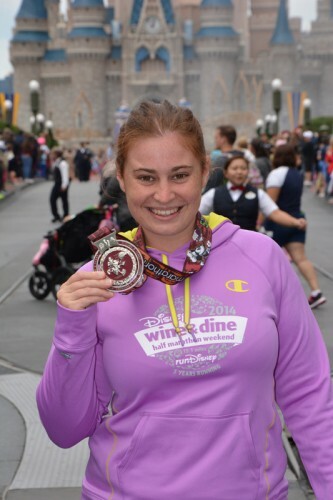 A Disney race wouldn’t be complete without post race, park touring with my medal. I had heard some horror stories about people’s medals breaking and people losing the spinner middle from the medal, so I decided to play it safe and only wear the medal in photos. The rest of the day it was tucked safely into my pocket. Even though I was a little disappointed I couldn’t wear my medal, I would have been devastated if it had have broken, so I think I made a good choice to just use it for photo ops. I loved showing off my medals at the parks and it was awesome having total strangers come up to me and congratulate me! My Wine and Dine Half Marathon weekend trip was a blast, and as I write this I am getting ready to race Avengers in California and get my coast to coast. 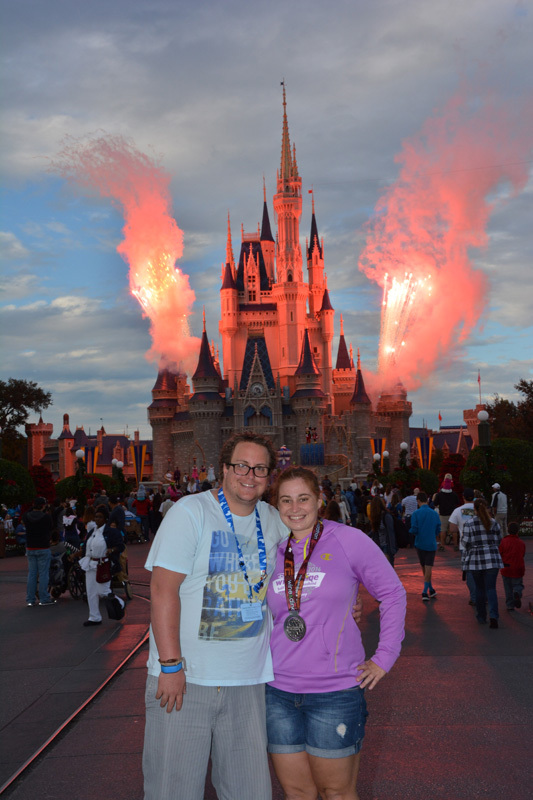 I had an awesome experience running Disney and I am already planning my next runDisney trip! 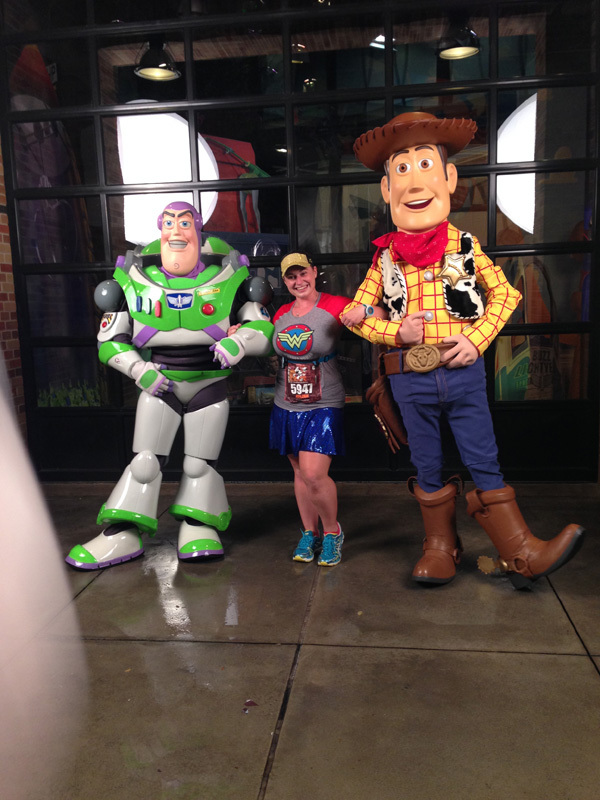 Stay tuned for Part 2 of Ashleigh’s runDisney adventure at the Avengers Half Marathon coming up tomorrow! Awww! What a wonderful adventure! I loved reading about this and I’m so glad it was such a great experience for you!